The Draft Environmental Impact Statement (DEIS) evaluates the Mandatory Housing Affordability (MHA) program impacts in Urban Villages, and in multi-family and commercial areas throughout Seattle. It presents three alternatives. The first alternative is to not do the MHA Upzone program. The second appears to be an expanded variation of what was presented at the end of the HALA Focus Groups and in the Urban Village Workshops. The third alternative presented is brand new, and is not based on discussions with the HALA Focus Groups or the Urban Village Design Workshops. Please request to extend the MHA DEIS comment period! Released on June 8, 2017, the DEIS is 462 pages long and the appendices are 364 pages long. This is over 800 pages to review within only 32 days. Please send your request to: MHA.EIS@seattle.gov, as well as to the City Council by phone, 206-684-8888, and/or by email: Lisa Herbold, Bruce Harrell, Kshama Sawant, Rob Johnson, Debora Juarez, Mike O’Brien, Sally Bagshaw, Tim Burgess, Lorena González. These documents may be viewed or downloaded from the City’s MHA Environmental Impact Statement website, or from copies in the EIS folder on the Wallingford Community Council (WCC) website. These are large documents! The main document is 50 MB, and the appendices are 95 MB. 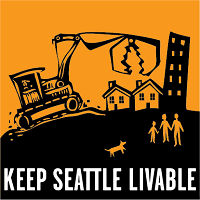 Attend the Public Hearing on the DEIS on Thursday June 29, 5:30 PM at Seattle City Hall. Open House at 5:30 PM; Public Hearing starts at 6:30 PM. Request an extension to the MHA DEIS comment period. Ask for clarifications on MHA issues. Share your concerns on MHA impacts. Please comment on the proposed Design Review Process “Improvements” by Monday July 10, 5:00 PM. Leave the Design Review Process as is. Direct city employees and the Design Review Boards to enforce existing design guidelines. Growth without Oversight: Without the check and balance of inclusive design review, growth can destroy neighborhoods. With it, the character and quality of the neighborhood is strengthened when adding housing and commercial spaces. Click here for WCC call-to-action and contact information for comments. This entry was posted in Backyard Cottages, Calls to Action, City Council, Land Use, Mayor, Parking, Quality of Life, Schools, Transportation, WallHALA on June 28, 2017 by Frank Fay. Do you believe in responsible growth that is positive for your community’s quality of life as well as benefitting developers and investors? Then make your voice heard with the City Council! The City’s proposal to amend the design review process takes away your influence concerning what gets built in your neighborhood. The City and Neighborhood Design Guidelines combine with the two public Design Review Review meetings format to make growth fit within the context of your neighborhood. Without the check and balance of inclusive design review, growth can destroy neighborhoods. With it, the character and quality of the neighborhood is strengthened when adding housing and commercial spaces. Public comments will be accepted through Monday July 10, 2017. SEPA appeals may be made through Thursday June 29, 2017. “Neighborhood priorities among the design guidelines” with “identify guideline priorities”. “Highest priority to the neighborhood” with “highest priority to the Board”. Exempting projects on properties of less than 10,000 square feet from any design review. In the past 2 years, 29% of projects were in this category. For perspective: most four story apartment buildings are on properties of less than 10,000 square feet. Administrative – Developments inside Urban Villages get Administrative Design Review, with no public meetings, if less than 20,000 square feet. Hybrid – Developments up to 20,000 square feet (or larger inside an Urban Village) would require only the Design Review Board “Recommendation” meeting and not the “Early Design Guidance” meeting. Full – Only the largest developments, over 20,000 square feet, and only outside Urban Village boundaries, would require the normal Design Review Board “Early Design Guidance” and “Recommendation” meetings. Revising who is a stakeholder by changing straightforward terms such as “Developers” to more generic terms like “Project Proponents”. Shifting responsibility and authority from the Design Review Board to the Director. This has the effect of making Design Review Boards less independent, and will make the Board positions less attractive to the professionals who volunteer their time. Granting departures from design guidelines without public review. Your input DOES MATTER! Last year, due to comments and push-back from all over the city, the proposed changes were tabled until now. This entry was posted in Calls to Action, City Council, Land Use, Mayor, Quality of Life, WallHALA on June 23, 2017 by Frank Fay. Here are some of the upcoming public forums for Mayoral and City Council candidates. Please use these opportunities to bring to the attention of the candidates your concerns about livable neighborhoods, affordable housing, Urban Village zoning changes, neighborhood representation, impact fees, transportation, parking, and other important issues. The Seattle Neighborhood Coalition (SNC) will have two programs dedicated to extended meetings with Seattle Mayoral Candidates. Each meeting will have one hour individual sessions with 3 different candidates. The candidates will make opening and closing statements, respond to a few fixed questions from the SNC, and then respond to audience questions. The Saturday June 10, 1:00 PM meeting is with Jessyn Farrell, Jenny Durkan, and Nikkita Oliver at Black Zone, 2301 South Jackson Street, Suite 203. Admission is $10 (which includes finger foods), but no one will be turned away for lack of funds. The Saturday July 8, 8:30 AM meeting is with Cary Moon, Michael McGinn, and Bob Hasagawa at the Central Area Senior Center, 500 30th Ave S. Admission is $6 (or $14 for buffet breakfast), but no one will be turned away for lack of funds. The Fremont Chamber of Commerce, the Wallingford Chamber of Commerce, the North Seattle Industrial Association, and the Seattle Propeller Club have invited the Mayoral candidates, City Council At Large candidates, City Attorney Candidates, and Port Commissioner candidates to the Picnic in the Park Candidate Forum at the picnic area in Gas Works Park, 2101 N Northlake Way on Wednesday June 21, 12:00 – 1:30 PM. Admission is $20 for members & $25 for non-members. Register to pay ahead or pay at the door. Our Revolution Ballard, in cooperation with the 36th District Democrats and Trinity United Methodist Church, is hosting a forum for the candidates running for Seattle City Council Position 8. So far, six candidates have agreed to join us for the forum: Hisam Goueli, Jon Grant, Mac McGregor, Teresa Mosqueda, Sheley Secrest, and Charlene Strong. At Trinity United Methodist Church, 6512 23rd Ave NW on Tuesday June 27, 6:00 – 8:00 PM. This entry was posted in Calls to Action, City Council, Mayor on June 8, 2017 by Frank Fay. Councilmember Mike O’Brien will have Office Hours at the Ballard Public Library on Wednesday April 5, 4:30 – 6:30 PM. This entry was posted in Backyard Cottages, City Council, Land Use, Parking, Quality of Life, Schools, Shorelines, Transportation, WallHALA on March 31, 2017 by Frank Fay. Seattle City Councilmember Lorena González is hosting an Open House this Thursday, January 12 at 2:00 – 4:00 PM in City Hall. As an At-Large Councilmember, she is up for re-election this year. An RSVP is requested. This entry was posted in Backyard Cottages, Calls to Action, City Council, Land Use, Parking, Quality of Life, Schools, Shorelines, Transportation, WallHALA on January 10, 2017 by Frank Fay. Councilmember Mike O’Brien (District 6 / Northwest Seattle) is hosting drop-in office hours at the Green Lake Public Library on Wednesday October 26, 3:00 – 6:00 PM. This entry was posted in Backyard Cottages, City Council, Land Use, Parking, Quality of Life, Schools, Shorelines, Transportation on October 25, 2016 by Frank Fay.